Bitcoin is advancing at an incredible rate, but we will probably need to wait for the start of weekend trading, before witnessing stronger moves above $5,000. At the time of writing, Bitstamp’s US dollar denominated bitcoin trading pair was holding at $4,897.31, just shy of the latest $4,935 all-time high. With daily volume persevering, the short-term outlook is tilting toward an overall bullish sentiment. Most altcoins have been highly suppressed in the face of it all. This equally applies to larger, medium, and small crypto coin market caps, although choice micro caps are proving strangely resilient. 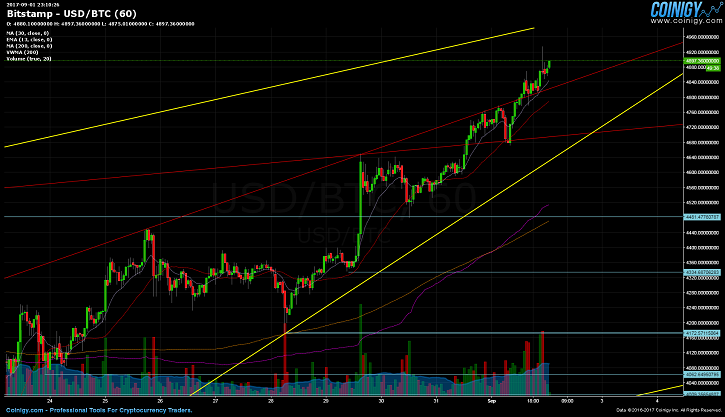 Litecoin has blasted up to almost $90, a new all-time high. Paying $100 for a coin that is commonly referred to as “The Rock”, is starting to look like an eventuality. Ethereum classic is on the move as well, and just recently shot over $20. Meanwhile, bitcoin cash has kept to a respectable trading range, which has remained bound by the $523 weekly low and $665 weekly high. 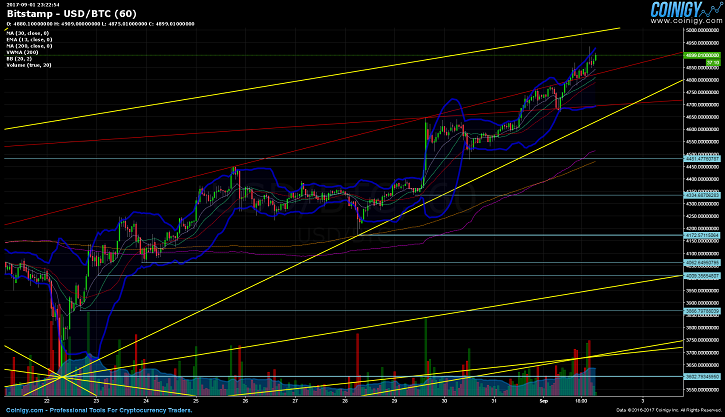 The bitcoin offshoot has held around a 600$ price point in the past few days. With bountiful supports, the Bitstamp bitcoin $4,169.01 weekly low stands out, as does the $3,600 biweekly low, which was unexpectedly revisited more than a week ago. 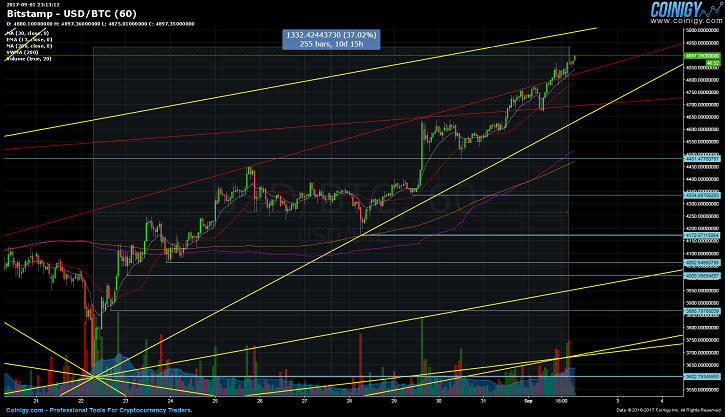 Dispersed in between are secondary supports at $4,481.47, $4,334.68, $4,062.64, $4,009.35, and at $3,866.79. Understandably, resistance levels are essentially non-existent at the moment. Relying on Fibonacci extensions from the prior trading range, will provide more clarity, at least in regards to possible future price levels. The 1.382 fib is set at $5,680.03, with the 1.618 fib at $5,885.97, the 2.0 fib at $6,219.31, and at the extreme end of the spectrum, the 2.618 fib at $6,758.58. Aside from the multiple intersecting trend lines at the $3,600 biweekly low, there have really not been that many points of interest. 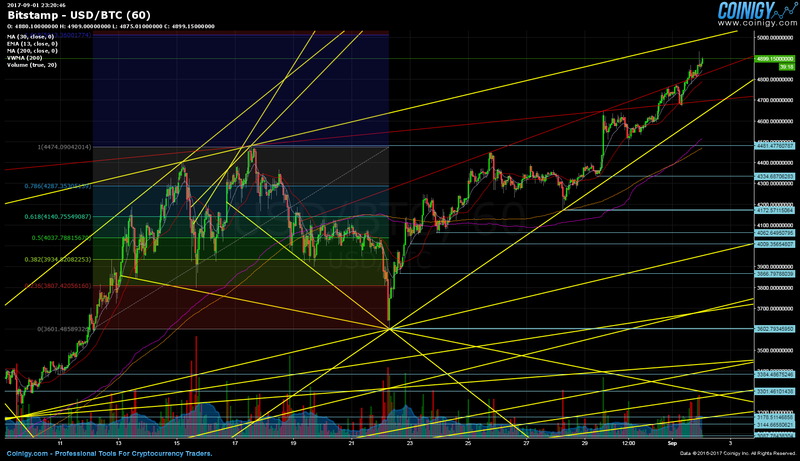 Shattered trend lines are marked in red, and a narrowing ascending channel has formed, which remains valid for now. Bollinger bands on the hourly are noticeably expanding, volatility may be imminent. The price has fired above the upper bands as well, a highly bullish sign. The 4-hour is in a similar rising state, with the Bollinger band gap seeming even more pronounced, on top of the breakout above the upper band. The circumstances are practically identical on the daily, with the upper and lesser band disparity appearing more constant. After a bullish MA crossover on August 23, the 30-day MA has soared away from the 200-day MA, while keeping a relatively comfortable distance. Until a dip of the 200-day MA below the 30-day MA occurs, the overwhelming bias is going to stay bullish, in line with price movement and momentum. The RSI is propelling toward overbought conditions, which can be considered slightly bearish on the hourly. Williams %R is inconclusive, neutral for the time being. At a glance, OBV shows promise from the present bottom, an increase in volume should reverse the underlying trend and direction. August 1 began with a bearish crossover (GMT 00:05) of the MACD below the signal line (marked with a red vertical line). This was soon followed by a bullish crossover of the MACD (green vertical line above) later during the same day at noon. 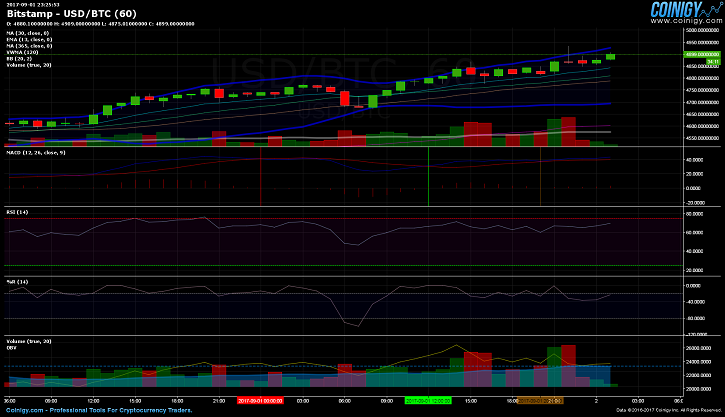 A drop of the MACD under the signal line almost occurred once more at 21:00 GMT. However, we have instead observed both in close proximity, with the MACD hovering marginally beyond the signal line (orange vertical line on the chart). 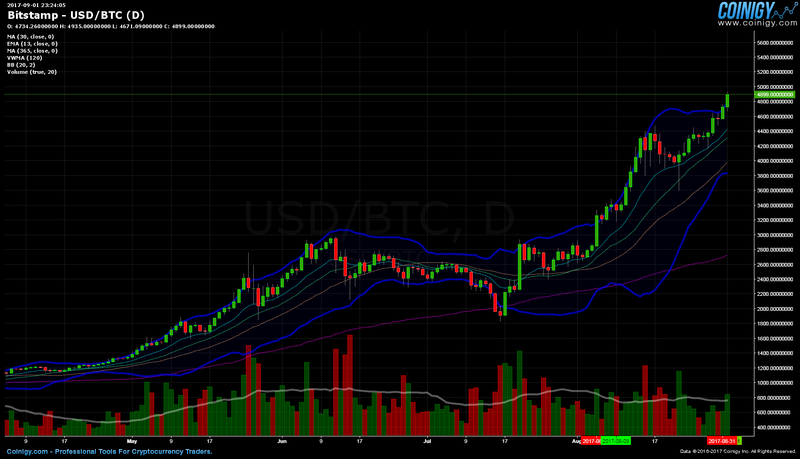 Bitcoin began trading from the $3,600 biweekly low on August 22 (GMT 05:00). After a high of $4,451 on August 25 (GMT 16:00), the price fell to the $4,169.01 weekly low on August 28 (GMT 06:00). A steady stream of higher highs, had ensued on a daily basis, until finally, the new $4,935 all-time high was achieved.